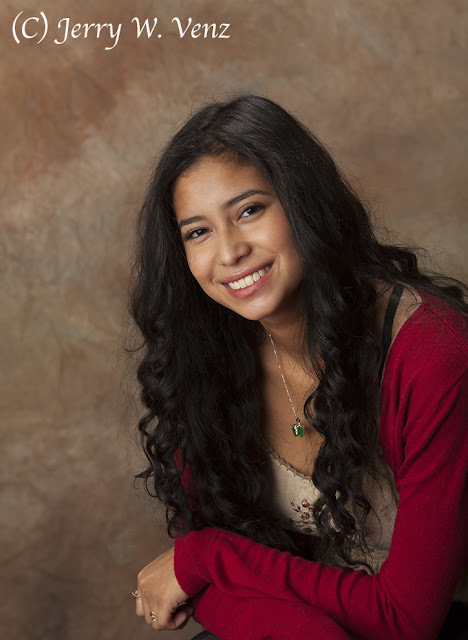 When doing portraits of Tweens, Teens and high School Seniors, here at The Storytellers, in Meridian Idaho my absolute favorite type of session is the themed or personal storytelling variety. When I say that I’m not just talking about the jock with a football or basketball—we do that of course—but, I’ve found that there’s a greater creative challenge with teens that are involved in music—or any of the arts—animal husbandry (4H Clubs), any equestrian pursuits, sports like archery and shooting, hunting, motor sports (drag racing, motocross, etc.) winter sports (skiing, snowboard, snowmobile), and the non-motorized sports like skateboarding, BMX or Triathlon. I’m sure I left something out, but you get the idea. Photographing people who are really passionate about these activities, as they do them, can create a connection between us that makes it easier for them to be more at ease when we finally do their more formal (looking at the camera) portraits. Conversely the portrait session of a tween or teen that I dread the most is when the parent tells me that they don’t do anything! Often this really means that their teen worn’t perform the activity in front of my camera—which is ironic these days when they share everything on social media! So, when we got the call to schedule this tween’s portrait session and Mom told us that her 16 yer old daughter was really into all things Harry Potter, my dread factor went up a bit. Hoping for the best, Kathi told the mom to bring everything they had in the Harry Potter theme. After I saw her collection of magic wands, I put up my “magical” background to get her in the mood to cast some spells! 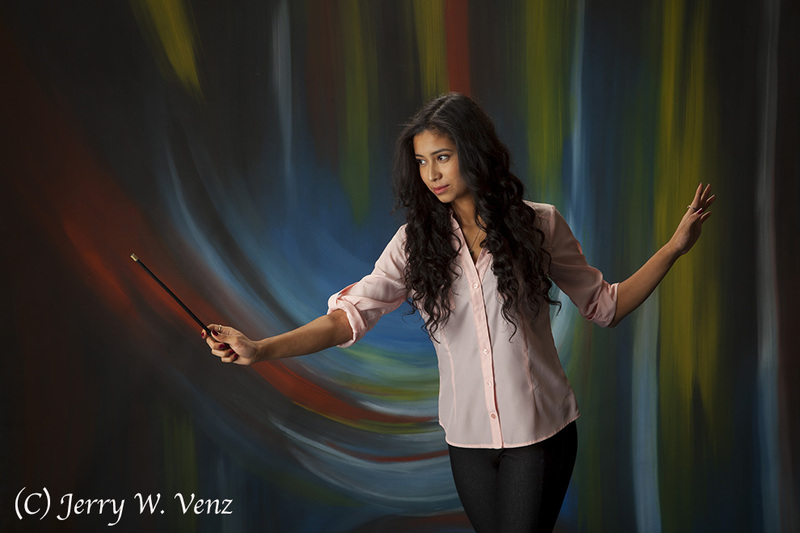 My dread factor quickly disappeared when I saw this young lady casting her spells with such grace and poise. 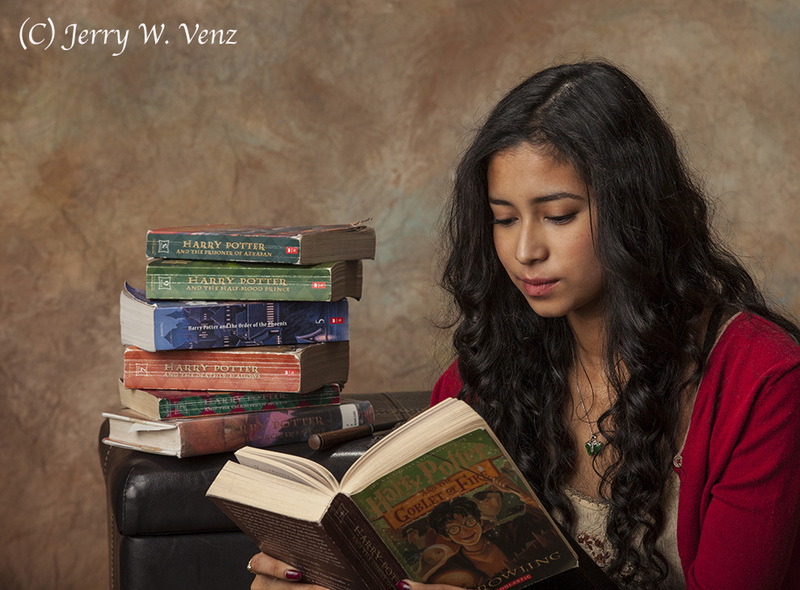 She did a clothing change while we changed the background for the Harry Potter books image. I loved her collection of dog-eared Harry Potter books! We did this in a variety of ways, but I liked her actually reading the book—more as a candid image. 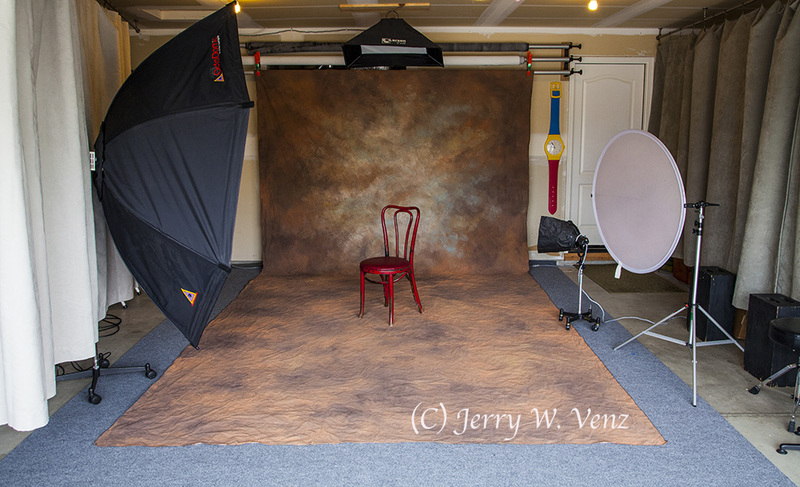 Caption: Photogenic PowerLight on the Main Light: Photoflex, 7-Foot, Octo-Dome; Other Lights: Norman Pack using a Larson 24” strip light (hair light) and one Norman head on background. Reflector Photoflex, 42”, White/Gold; white side to the subject. 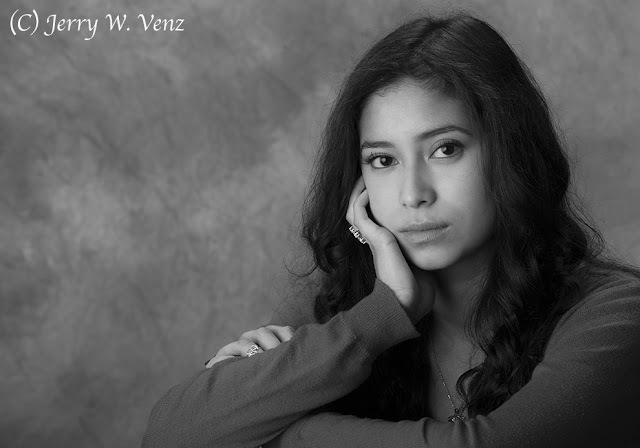 Looking at the camera and smiling came easily for this young lady. Then we went for something more thoughtful…. I usually do something in Black and White and I like this composition with its “negative space” to the left. I also like to do portraits of people both smiling and not smiling to see which they are more relaxed with. Often the non-smiling portrait gives me bigger eyes—which I prefer in a portrait—because many people’s eyes narrow as they smile. That’s it for this week….happy to answer questions…’Til next time!